Doug and I are missing Biscuit very much. We especially miss the ordinary events and things that happen naturally throughout the course of a normal day together. The toughest moments so far are when we come home, we anticipate that we will hear Biscuit’s nails hitting the hardwood floors as he comes walking out of the bedroom doing his sheltie stretch with a smile, happy to see us, ready for either a belly rub, a walk, or dinner — depending upon the time of day, Biscuit always let us know what he wanted and needed! Whenever Doug and I left the house together, on the rare occasions when Biscuit did not (or could not) come with us, depending upon where we were going, we talked to him to reassure him know that we would be back shortly and not to worry. Biscuit always wanted to be with us and his biggest fear and anxiety was being left somewhere without us! Biscuit usually understood that we would be back to greet him soon, and he gladly went and took a nap on his bed in front of his fan in our bedroom. However, sometimes, Biscuit wanted to come with us and he let us know this as he walked right up to the front door trying, with all his might, after we opened the front door slightly, to push through the slight opening of the front door leading to the outside to come with us! There were times that Biscuit successfully meandered through the front door opening to the outside onto the front porch, and we then had to take him off the porch and put him in back in the house! Other times, when we could, we modified our plans so that he could come with us and be included like he wanted. It always broke our hearts when we were unable to take him with us. He was a smart little sheltie! However, we have many, many fond memories of taking Biscuit various places with us. Biscuit accompanied us to countless places more often than not. As I work at my computer at home, I anticipate looking down and seeing Biscuit by my side. I wrote almost every blog post with Biscuit by my side. He was also always by my side with me as I culled and edited photos; and when I worked on other things while at my desk. I truly enjoyed our time together. I loved that Biscuit always followed me around the house to be by my side. I miss Biscuit by my side. I also very much miss seeing Biscuit during the morning. Doug always came into our bedroom to see us before leaving for work, and then I started to get ready for the day, and Biscuit and I had the same routine each morning. He would immediately want his Greenie Pill Pockets, which was the only way he agreed to take his various medicines and supplements two times a day. Biscuit transited the bathroom as I got ready each morning. He patiently sat just outside the bathroom as I showered and dried my hair. After I finished getting ready, we took our morning walk together. I greatly enjoyed our time in the mornings together. After our walks, Biscuit always came back into the house and sat by our coffee table in the living room and waited patiently for a few pieces of his prescription kibble — a treat and reward for going potty during his walk! Again, Biscuit loved the routine and I came to love our routine as well, which became a fixture in our lives. I also miss taking Biscuit with us to the new house. This week was the first time our little Biscuit was not there to accompany us to the new house, which made us sad. We do believe that after all those enjoyable trips to the new house, that Biscuit knew we were making a new home for all of us. We know that he will still be there with us in the new house where his images will continue to adorn our home. We also miss taking him to dinner with us as well. With it being summer time, Biscuit came with us out to dinner quite often. We enjoyed the spring and summer months because the outside temperatures would allow us to take Biscuit out to eat with us. Doug always discovered and thought of interesting places to take Biscuit to keep Biscuit engaged, especially as we waited to move to our new home. We also miss our daily walks together. Our walks together was a time all three of us spent together outside reflecting on the day together. Biscuit never complained about his arthritis and he was always happy to go on walks together as he led the way for us each day. Doug was always an attentive Daddy to Biscuit as he kept track of Biscuit’s “poop schedule” to help prevent any accidents in the house! These above items are only a few things we miss about Biscuit. He really added so much joy to our lives. Right now, it feels very different without him. Doug and I have never experienced a loss as great as Biscuit. Our relationship and bond with Biscuit was like no other. Some truly can relate to this relationship, while others, who have never experienced such a relationship, do not understand and are unable to comprehend the depths and love of such a special and unique relationship. I am reminded of the importance to be brave in sadness and to be brave in love — that we must sit with the wholeness of who we are and what we experience, that we must honor the beauty and the pain, that we can be sad yet grateful, angry yet compassionate, broken yet held in wholeness. This is life. This is what it means to show up. This is what it means to live with an open heart where love and fear are adjacent companions. This is what it means to honor every experience however heartbreaking. To be brave in sadness; and to be brave in love. I am trying to be brave. Biscuit was always so brave and strong. 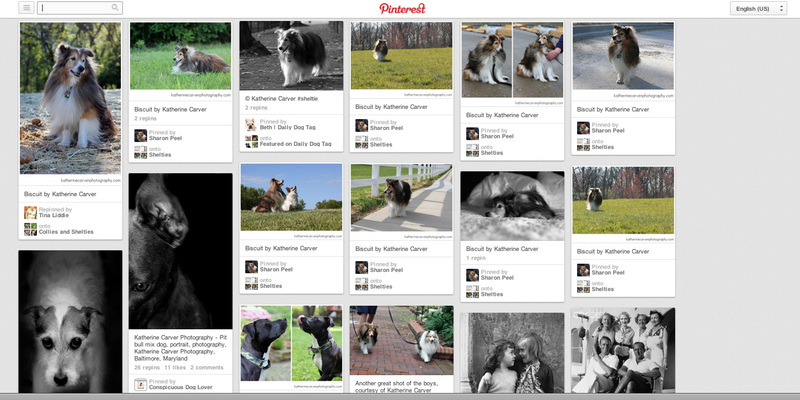 Doug and I do not have Pinterest (or Facebook) accounts; however, as we were recently going through the many photographs and videos of Biscuit at home, we learned that Biscuit is on Pinterest — what a happy surprise! A small snapshot is shown below. We are so happy that others fell in love with our little Biscuit via the blog and by meeting Biscuit in person! Finally, per Carol Guth, who heads the Sheltie Haven Sheltie Rescue, Inc., the rescue organization where Biscuit resided prior to us rescuing and adopting him, donations have already been received by this rescue organization in Biscuit’s honor. Thank you very much for your donations in honor of our little Biscuit. It means the world to us. Thank you. Thank you again for your kind, thoughtful, and heartfelt cards that you have sent; and thank you for your comforting words, which has been updated (and will continue to be updated) with your kind words since yesterday’s blog post. Thank you. We are so very sorry for the huge and painful loss of Biscuit. You are in our thoughts and prayers.